This tortilla recipe is sure to become a new family favourite! 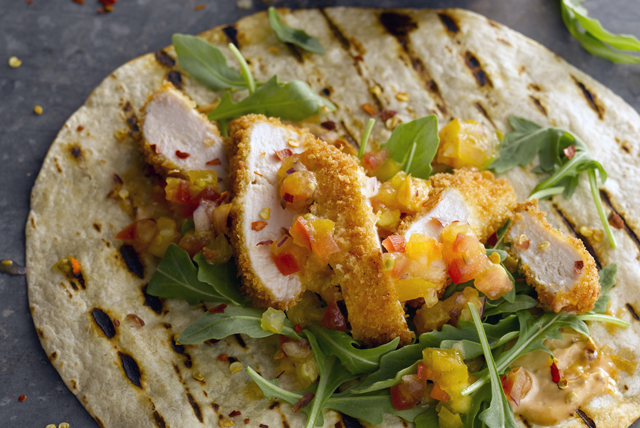 Made with zesty lime dressing, the mango salsa topping adds the perfect finishing touch to the breaded chicken tenders. Bake chicken as directed on package. Meanwhile, combine mangos, cilantro, onions and lime dressing. Cut chicken into strips. Spread tortillas with ranch dressing; top with arugula, chicken and mango mixture. Fold in opposite sides of each tortilla, then roll up burrito style. Heat barbecue to medium-high heat. Grill tortillas 1 min. on each side or until lightly toasted on both sides. Substitute torn romaine lettuce for the arugula.